Q. Where and when was the picture taken? A. Along the Nile at a concert with hip-hop / sha3bi music. Q. What happened the minute after the picture was taken? Q. Why was the photographer there at that moment? A. I’d been in Tahrir filming for a documentary I am working on ولاد الخرطوش Boys of the Bullet. That night, police started firing tear gas heavily from Asr el Aini Street. While running, the boy we were filming had his cell phone stolen out of his hand, and lost his friend in the crowd. He decided to go home. We took a break to check out the show. Q. What is the story of the picture? A. 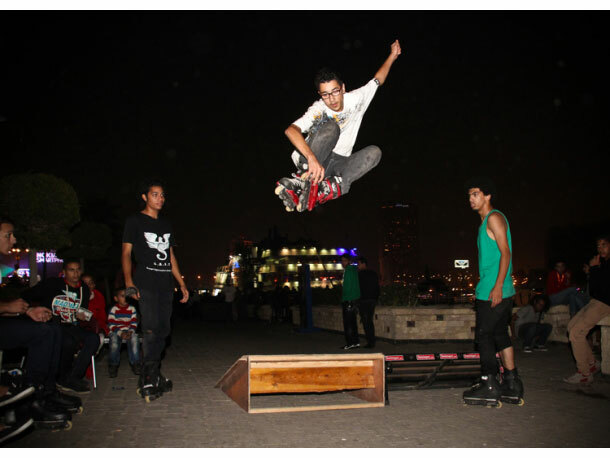 Although clashes and politics are dominating headlines, life goes on in Egypt. This is a glimpse into youth culture. Q. What is missing on the picture? A. What I’d like to have also captured were his parents, who were watching on the sidelines. His father came up to me after his jump and asked to see the photo, and gave me a thumbs up, saying, “Gamda” (great). Q. To whom would you like to show this picture? A. The boy, his parents, and everyone who thinks only of tourist stereotypes or Tahrir when they think of Egypt.